From luxuriously furnished historic country house hotels to ultra-stylish inner-city hotels with all modern conveniences, the diversity of UK hotels means that there’s great accommodation to suit every taste and budget to be found throughout Britain. And whilst excellent traditional and chain lodgings are abundant if you’re looking for cut price deals, if you’re seeking something a little more ‘off-the-wall’ (which you won’t find listed on Groupon!) to make your stay even more memorable why not check out, and then check in, to these five extraordinary UK hotels? 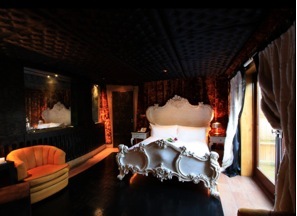 Crazy Bear – crazy name, crazy hotel. The Reception is an original Routemaster London bus. The suites are sumptuously furnished, and are named after various colours: Jet Black, Silver, Purple, Copper (pictured), Zinc etc. with décor and finishes that reflect the name. The Crazy Bear’s standard rooms and cottages are, for some reason, named after cigar brands, hence you might find yourself sleeping in the Cohiba or Montecristo room. But no matter which room you stay in you can guarantee that the décor will be striking (zebra-print floors seem to feature throughout) and your stay nothing less than unforgettable. Imagine emerging from your luxury safari tent at sunset to gaze upon the herds of zebra and giraffe that congregate on grassy plains that stretch to the horizon. An elephant wanders past. Is this Kenya? Zambia? Mozambique? Nope, these are the wild savannahs of… er Kent, southeast England. 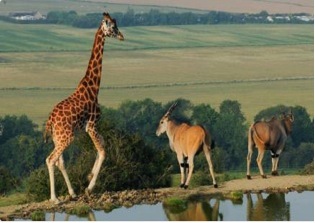 Livingstone Lodge offers the UK’s only authentic African safari experience, providing accommodation that includes from beautifully-appointed safari tents, a luxury cottage and comfortable lodge tents which overlook the elephant paddocks. 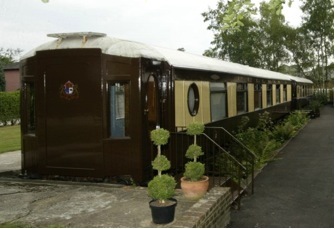 How often can you boast that you’ve slept in style in a carriage of the Orient Express. That’s what’s on offer at the extraordinary Old Railway Station Hotel, as well as the opportunity to spend the night in the converted Petworth Railway Station itself, which dates from 1892. The beautifully restored Pullman train carriages retain the character and splendour of the Golden Age of rail travel, right down to the immaculately tiled en-suite bathrooms. 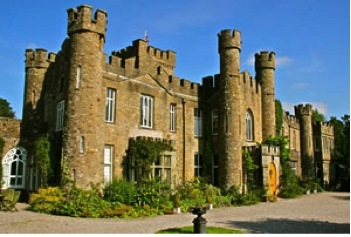 As the name suggests, this hotel really is a castle complete with towers, turrets and crenellations; all that’s missing is a drawbridge and moat. Set in its own gardens and situated in England’s Lake District – an area of outstanding natural beauty – the informal atmosphere and stunning rooms, each with a traditional four-poster bed and lavishly decorated, make Augill Castle a truly special UK hotel for a (k)night’s stay that won’t break the bank. 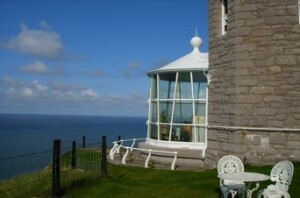 Proving that not all seaside hotels are the same, this magnificent lighthouse protected ships off the Welsh coast from 1862 to 1995. 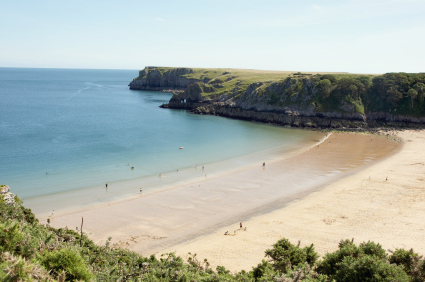 Constructed from Canadian Pine and limestone, the Lighthouse Hotel is situated in the peaceful and beautiful Great Orme Country Park. The hotel’s dining room overlooks a 100 meter vertical drop to the sea, whilst one of the bedrooms is in the former Lamp Room and offers stunning panoramic views out to sea.